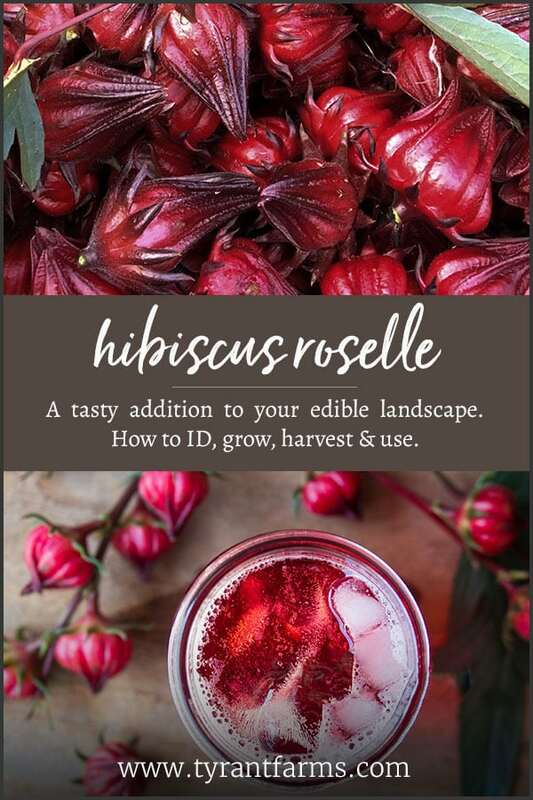 Hibiscus tea, hibiscus jelly, hibiscus relish… yes, hibiscus plants don’t just make beautiful flowers, they can also make wonderful edible plants! 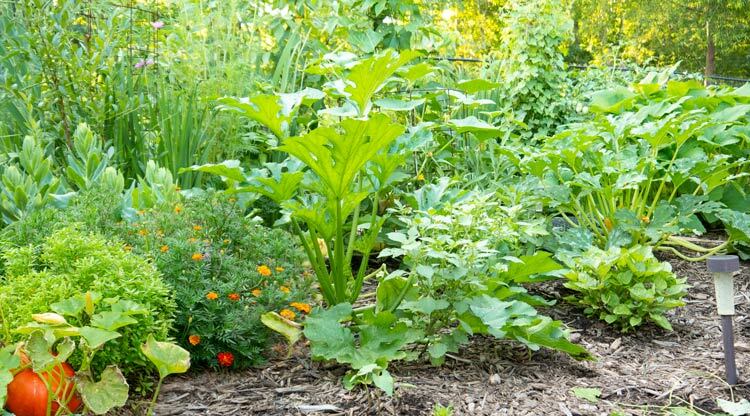 In this article, you’ll learn more how to ID, grow, and use edible hibiscus (Hibiscus sabdariffa). Updated with new information: Feb 4, 2019. Many people have heard of hibiscus plants and can even identify a hibiscus flower. 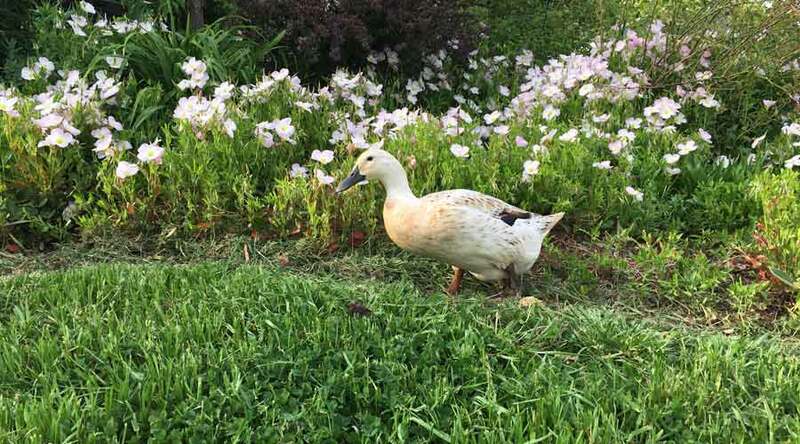 After all, the plants are quite common in traditional landscapes where they’re beloved for their large, showy flowers that bloom throughout the summer – or longer in warmer climate zones. Are all hibiscus plants edible? For many years now, we’ve enjoyed growing and eating Hibiscus sabdariffa, aka ‘Florida cranberry,’ ‘Cranberry hibiscus,’ and ‘Roselle.’ Yes, this plant has quite a few common names, which is why we use the botanical name to avoid confusion! Hibiscus sabdariffa is a hibiscus subspecies best known for its edibility, and it’s the hibiscus variety traditionally used to make hibiscus tea. Hibiscus sabdariffa is a large, fast-growing, sun-loving shrub that is an annual in our temperate climate zone but perennial in tropical regions. Nope, it’s NOT the same plant as the also-edible hibiscus known as ‘False Roselle,’ (Hibiscus acetosella). Flowers, leaves, and calyxes of edible Hibiscus sabdariffa. As you might be able to tell from the flower structure (see above), hibiscus is in the Mallow family, and closely related to okra and cotton. It’s interesting to note that marshmallows (the confection) used to be made from marshmallows (a Mallow plant closely related to hibiscus) back before the advent of corn starch and high fructose corn syrup. 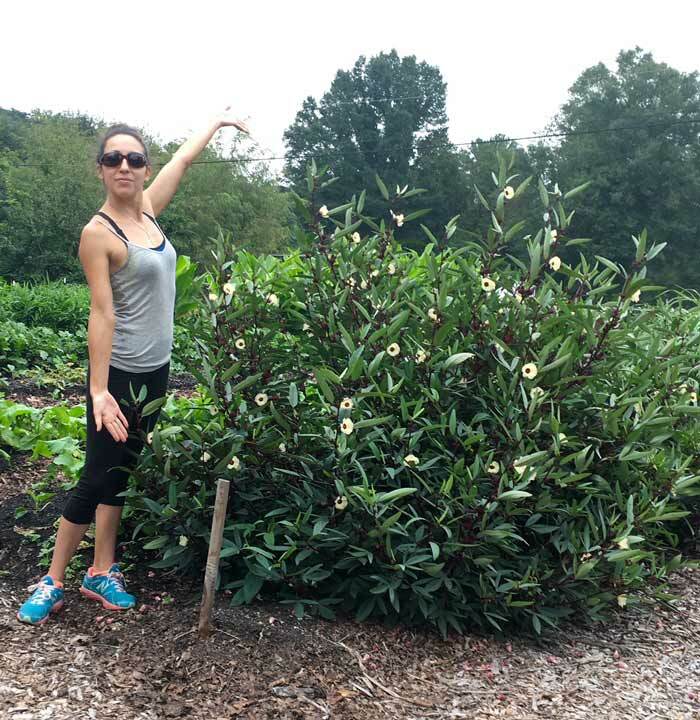 The Tyrant showing off an edible Hibiscus sabdariffa plant at Oak Hill Cafe & Farm. What part of a hibiscus plant is edible? All parts of Hibiscus sabdariffa are edible: calyxes, leaves, and flowers. The calyxes are the ingredient used to make Hibiscus tea, a tangy Vitamin C-rich delight. 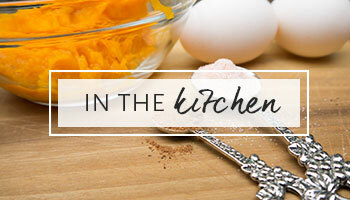 They’re also used to make sauces, jams, and other treats. The large green leaves pack a tangy punch and can also be used to make tea. The branches are covered with colorful yellow flowers. Once pollinated and mature, the flowers form ripe calyxes, with a seed pod inside. 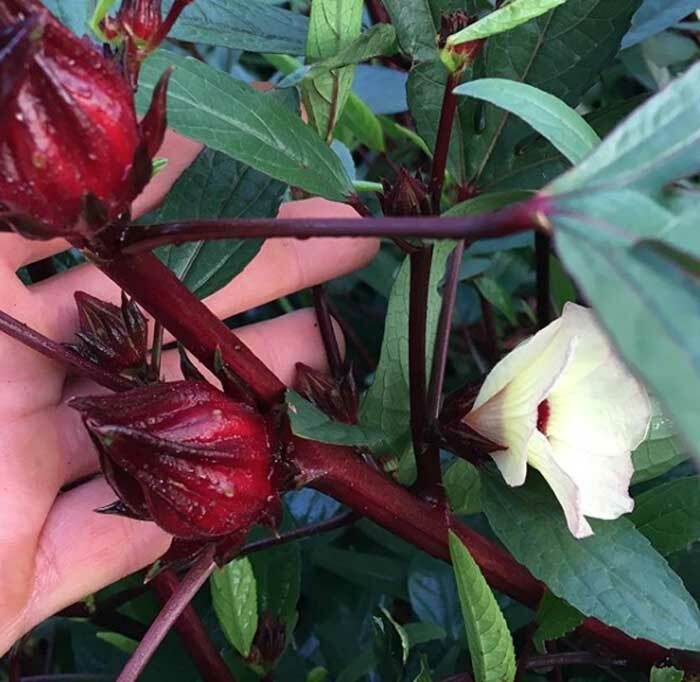 While these flowers are a bit smaller than the common Hibiscus varieties used by landscapers, the fact that they form a delightful edible fruit/calyx more than makes up for their size deficiency relative to hibiscus varieties bred purely for show. A handful of hibiscus calyxes. 1. Soak seeds for 24 hours. Some sources recommend scraping a hole in the seed surface with a file before sowing. We don’t think it’s worth the aggravation. Instead, soak your hibiscus seeds in water indoors for 24 hours before you plant them. This will soften up the thick, hard seed coating. Sow your pre-soaked hibiscus seeds indoors 6-8 weeks before your last frost date in spring. Plant them 1/4″ deep in dampened seed starting mix inside seed starting containers (biodegradable pots or plastic cells). 3. Use a heat mat. Hibiscus seeds need heat to sprout. Normal indoor temps around 70°F aren’t warm enough for ideal germination. To get the best and fastest hibiscus seed germination possible, start them on a heat mat set to 80°F. 4. 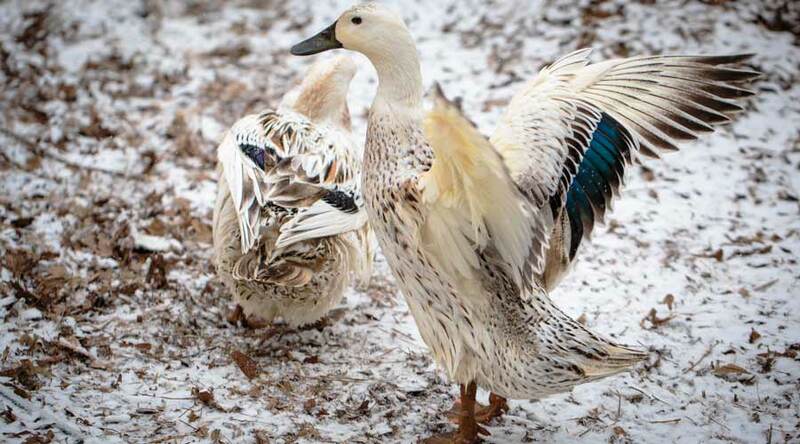 Keep soil warm and damp (not wet). Keep the containers on the warm heat mat and make sure to maintain adequate soil moisture (keep the seed starting mix damp, but not soaking wet). Within 10 days, the seeds should germinate. 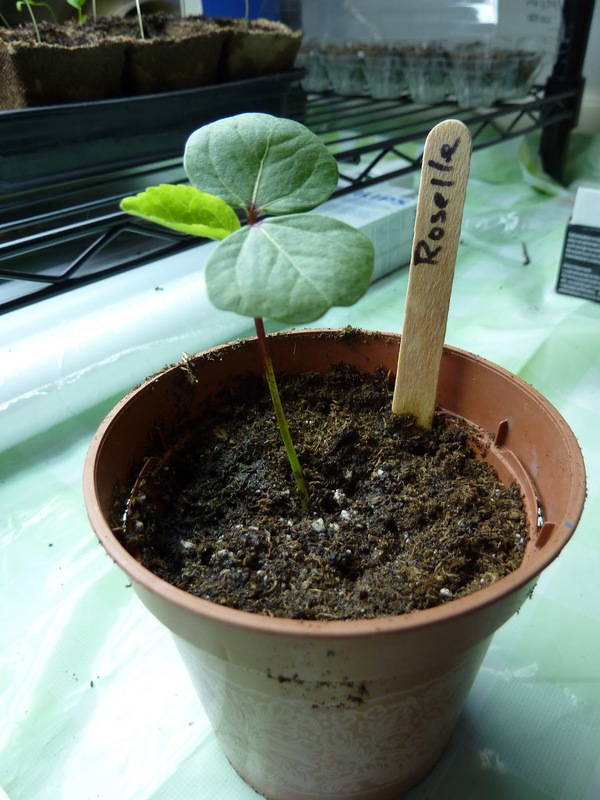 Edible Hibiscus sabdariffa seedling. 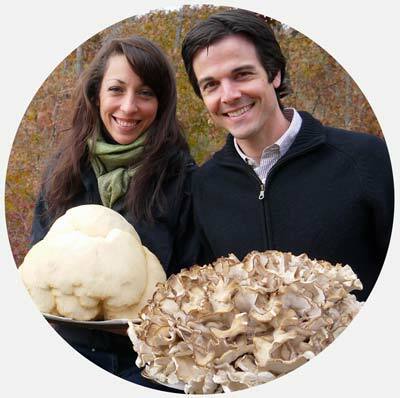 Image by University of Maryland Extension. 5. Place under grow lights. If you’re a serious gardener, we recommend making a DIY indoor grow light setup like this one. Modern, energy-efficient windows filter out too much sun to keep hibiscus seedlings healthy indoors. Put your hibiscus seedlings under grow lights, set to about 1-2″ over the tops of the plants (if using fluorescent bulbs). The heat mat is optional at this point, but the plants will grow faster if kept warmer. 6. Transfer outside after last frost. You may need to pot up your hibiscus seedlings into larger containers one time before it’s time to transplant them outdoors. Then, after your last frost date has passed and there are no temperatures below 40°F, transplant your hibiscus plants outdoors into their final location. Hibiscus sabdariffa plants can grow to 6′ tall x 4′ wide, so give them plenty of room! Also consider planting them inside wide, heavy tomato cages since the branches are subject to snapping in heavy winds if they’re loaded with calyxes. 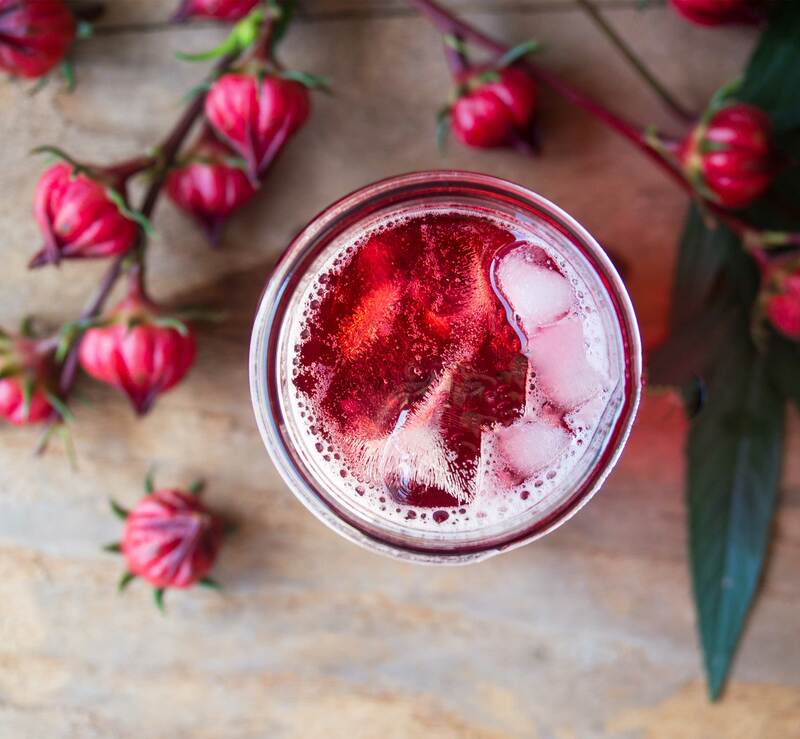 If you’ve ever enjoyed the electric pink colored hibiscus tea that’s popular around the globe from the Caribbean to Africa to the far east—then you’ve tried a Hibiscus sabdariffa calyx. If you haven’t and you’re just wondering how it tastes, unflavored “Hibiscus tea” tastes like lemon-cranberries and packs comparable medicinal and nutritional benefits. Yes, among other things, that means it contains loads of Vitamin C.
Hibiscus tea with muddled ginger & makrut lime leaves. Stevia (made from an herb) makes an ideal zero calorie sweetener. Pour boiling water over a cup containing three whole hibiscus calyxes (dried or fresh) and let steep. Tea should be bright pink when ready. Sweeten tea to taste, then serve! We like to sweeten our Hibiscus tea with stevia powder or local honey. We also like to add fresh-muddled ginger and makrut lime leaves for a spicy citrus finish. Poured over ice, Hibiscus Tea is one of our all-time favorite summer refreshment drinks. We have so many dehydrated hibiscus calyxes stored after this summer’s growing season, that we’re also planning to try some other experiments like Hibiscus jelly and spiced Hibiscus tea with cinnamon and cloves when the weather turns cold — yum! Deee-licious! A glass of gorgeous edible hibiscus tea, made from the calyxes of Hibiscus sabdariffa. 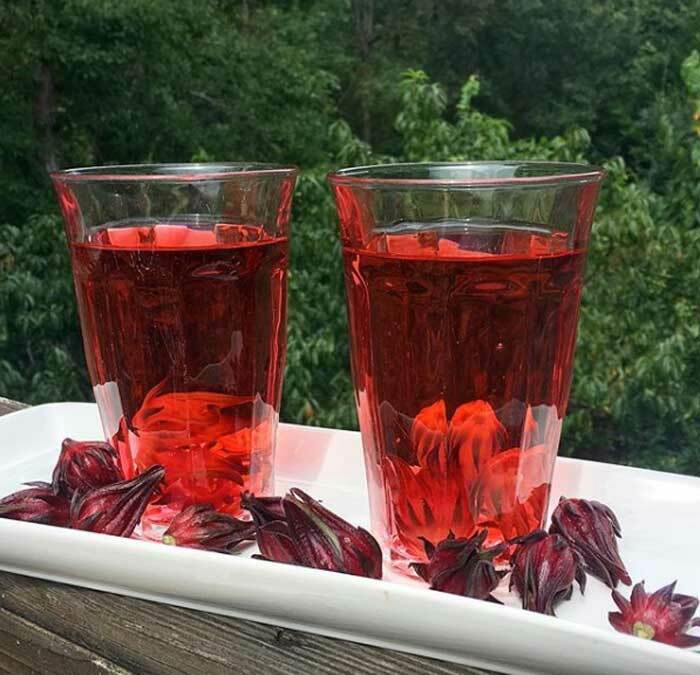 Three fresh or dried calyxes is all it takes to flavor a large glass of hibiscus tea. Even after the calyxes are removed from your tea glass, they’re still edible and quite yummy. In fact, as one of our Instagram followers from Nigeria told us, they can be used to make a great relish at this stage, similar to fresh cranberry relish. 1. Pick the Ripe Calyxes. After a hibiscus flower has bloomed, it will shrivel up and drop from the plant about 24-48 hours later. Then the calyx will begin to form. 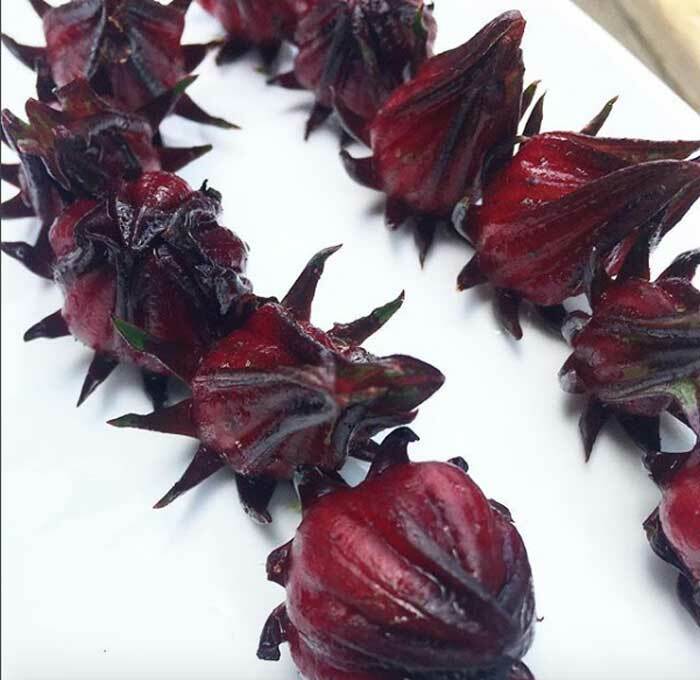 Freshly harvested edible hibiscus calyxes from Hibiscus sabdariffa plants. How do you know when to harvest the calyx? This is somewhat subjective, but we usually give them anywhere from 3-7 days after the flower has dropped. 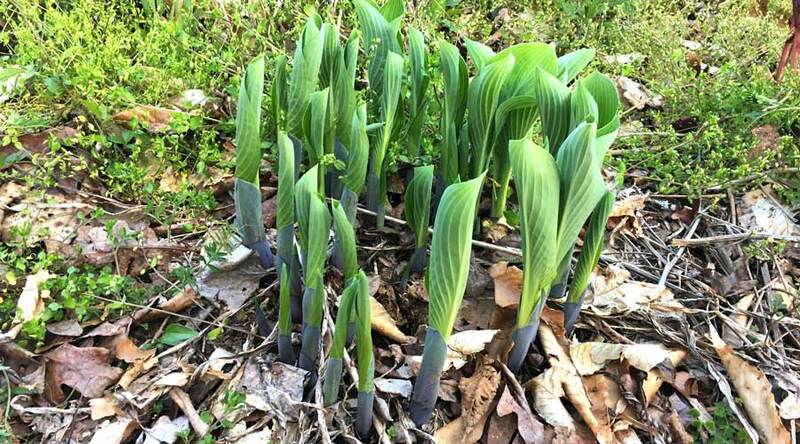 When young, the calyxes can be easily snapped off the plant by hand at the stem. When fully ripe, the calyxes will not easily snap off of the plant by hand. Instead, you’ll need to use clippers or snips to cut them off. Any calyxes you’re planning to pick and save for seed should be left on the plant for at least a few weeks so the seeds mature. A Hibiscus (Hibiscus sabdariffa) flower blooming at Tyrant Farms. Also notice the other older blooms turning into ripe calyxes below and to the left of the flower, and the nearly ripe calyx directly to the left of the flower. 2. Separate the Calyx From the Seed Pod. using your fingers, pop out the seed pod from the calyx. The goal is to try to keep the calyx as intact as possible, rather than having a bunch of small pieces. Hibiscus calyx (left) separated from the interior seed pod. The seed pods are too hard/solid to eat. 3. Immediately Use or Dry the Calyxes. If you plan to use the calyxes within 24-48 hours for tea, sauce, or fresh jelly, you can just leave them on your counter. However, the calyxes do start to lose moisture and texture the longer you let them sit, and they may even start to mold if you’ve had a lot of rain prior to harvest. Hibiscus tea tip: Even after the calyxes are removed from your tea glass, they’re still edible and quite yummy. In fact, as one of our Instagram followers from Nigeria told us, they can be used to make a great relish at this stage, similar to fresh cranberry relish. If you want to save the calyxes for later use, dry them (with seed pods removed) in a dehydrator or on a rack. We LOVE our Excalibur dehydrator for drying edible hibiscus and other garden delights that we grow throughout the year. Hibiscus calyxes drying on an Excalibur dehydrator rack at Tyrant Farms. We’re always amazed by how productive our Hibiscus sabdariffa plants are. Each year, we leave several of the largest calyxes on a few of our plants so we can grow seeds for future years. 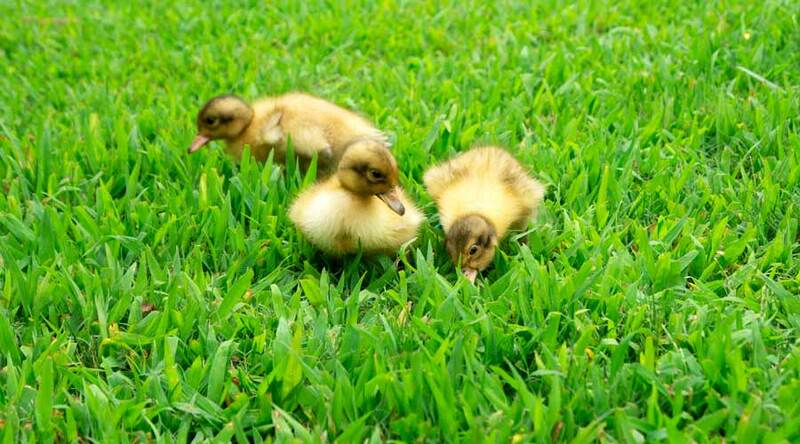 The longer you leave them on the plant, the better for seed production and seed viability. Once you harvest a Hibiscus sabdariffa calyx/seed pod for the express purpose of seed-saving, be sure to let the seed pods dry for a month inside before storing them in a ziplock or any container that would trap moisture and reduce their viability. The seed pods should be dry, brittle and easy to crack open, spilling out dozens of small black seeds for future bounties. Hibiscus seeds being separated from the seed pods. Remember, even though all varieties of hibiscus may be edible, the best variety of hibiscus for edible flowers, leaves, and calyxes is Hibiscus sabdariffa. 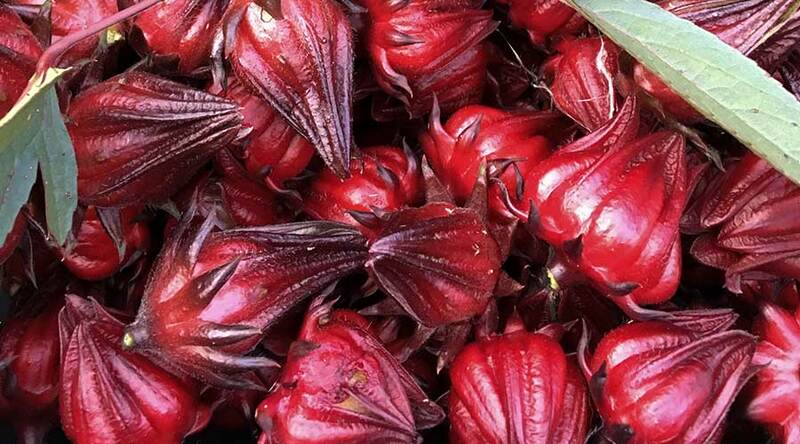 Want to buy edible hibiscus seeds, tea, or powder? 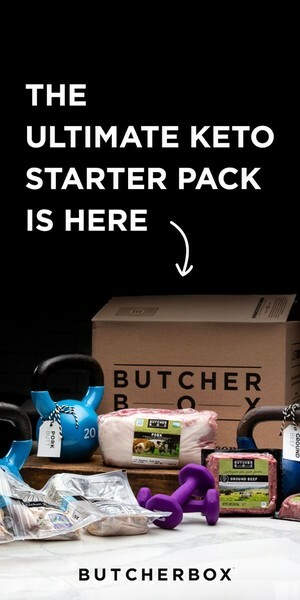 Click the links below! 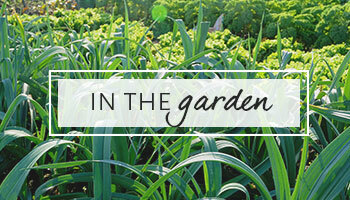 We hope you’ll decide to grow some beautiful, edible Hibiscus plants in your garden next summer!